Google has just rolled out new features for Allo, additions that may not convince you to use it as your primary chat app, but will improve the experience if you're using Allo at all. The first among these is incognito mode for groups. This feature encrypts group chats and will only save them for as long a period as you like with a timer that expires a chat once it's up. According to Google, you'll also get private notifications to help keep your group convos even more discreet. 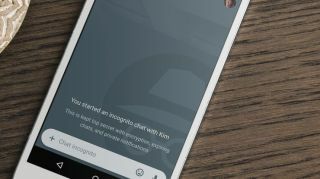 End-to-end encrypted incognito chats were already available for peer-to-peer conversations, so this latest update brings the same protections to groups. Also on tap, according to a tweet from Amit Fulay, Head of Product for Google Allo and its video counterpart Duo, is chat backup/restore, letting you save a current chat for later or go back and restore a conversation you've already had. Finally, there's link preview. Just about every major messaging app already has this feature, so if you've seen that little box that tells you what a link you're about to click on is all about, this is what Allo is getting. Google is in a bit of a weird space with messaging apps, which is actually par for the search giant's course. Let us explain: Google recently reconfigured Hangouts to be an enterprise chat offering, and Fulay tweeted right after the announcement that Allo and Duo will be Google's one-two punch for consumers. However, the waters were muddied when Fulay also tweeted that consumer Hangouts is sticking around, leading to confusion as to where Google's chat road map is headed. Allo hasn't caught on in the same way as Duo, which recently added voice-only calling, or other messaging platforms, like WhatsApp and Facebook Messenger. One oft-requested Allo feature is a desktop app, and Fulay said in a series of tweets in early March that one is coming. Perhaps a desktop Allo app will lead to greater adoption – right now it sits at under 50 million installs. Duo, meanwhile, has more than that. We'll likely get an earful on Google's various chat offerings – and maybe even meet a new one! – at Google IO 2017, the company's huge developer conference happening May 17 - May 19. It wouldn't surprise us if Allo's also-teased web version was revealed then, or if Google further discusses how it might streamline all its messaging platforms. We'll be on the ground at IO to bring you all the latest, so stay tuned to see which chat apps make it out alive.